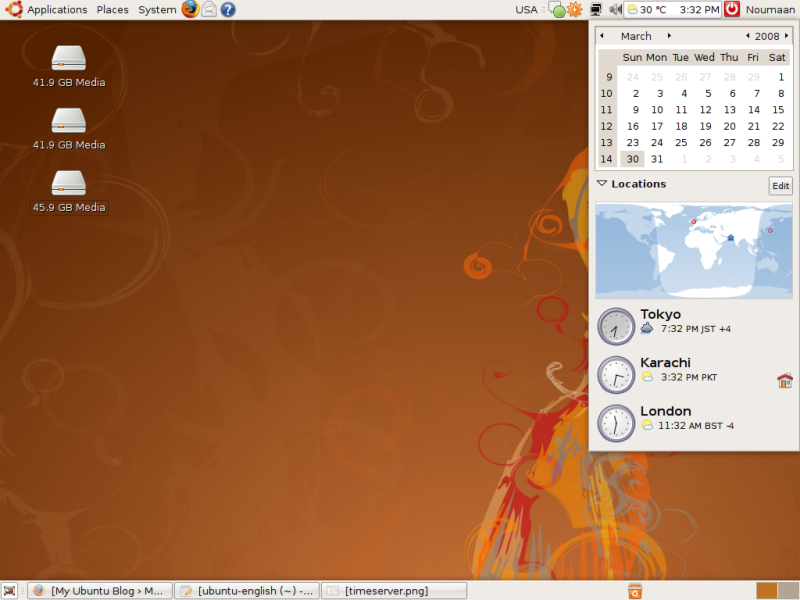 Today I downloaded and installed Ubuntu 8.04 Hardy Heron Beta version. There are several new things in this upcoming Ubuntu version. First of all it is a long term support version, which means that if you install it you will receive support and updates for up to three years and that will be totally free and no Genuine Advantage icon would ever bother you. Ubuntu is not just free, it is better too. As I mentioned in my earlier post that Windows XP and Vista fail to detect my hardware during a default installation. Ubuntu detects and configures all my hardware in the default installation. 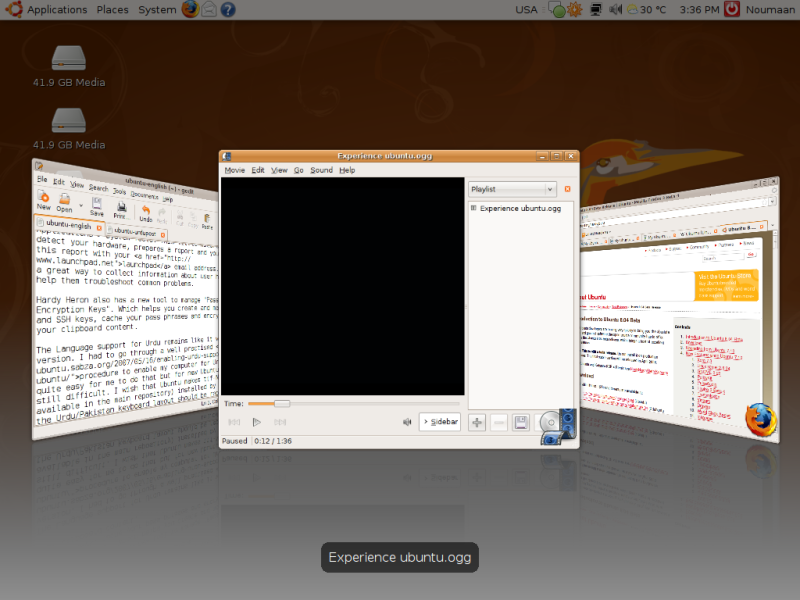 With Ubuntu Feisty I wasn’t able to use amazing visual effects. I had to apply a hack to do that and even then the effects were not at all plea sent. But now, Ubuntu Hardy Heron takes full advantage of my hardware and compiz effects are enabled by default and they work fantastic. This new version of Ubuntu has Firefox 3 Beta 4 installed as default web browser. This was my first time trying Firefox 3. I didn’t like the way it suggests URI’s as I type something in the address bar and I can not install Google’s browser sync plugin, I hope there is a work around to get it working. But for the first time Firefox looked like a well integrated part of Ubuntu. There is a new tool called “Hardware Testing” accessible from Applications > System Tools. This little wizard attempts to detect your hardware, prepares a report and you can then send this report with your launchpad email address. I think it is a great way to collect information about user hardware and help them troubleshoot common problems. Hardy Heron also has a new tool to manage “Passwords and Encryption Keys”. Which helps you create and manage your PGP and SSH keys, cache your pass phrases and encrypt/decrypt your clipboard content. The Language support for Urdu remains like it was in previous version. I had to go through a well practised procedure to enable my computer for Urdu. It is quite easy for me to do that but for new Ubuntu users it is still difficult. I wish that Ubuntu makes ttf-Nafess (already available in the main repository) installed by default and the Urdu/Pakistan keyboard layout should be replaced by this one. The default Ubuntu Urdu/Pakistan keyboard layout has its keys placed differently and new users find it difficult to use and eventually they replace it with the one I mentioned above. The release notes mentioned Inkscape, which made me and others believe that it would be installed by default. But it is not installed by default in this beta version. It may be available by default in the final release. The final stable version will be available in April 2008. 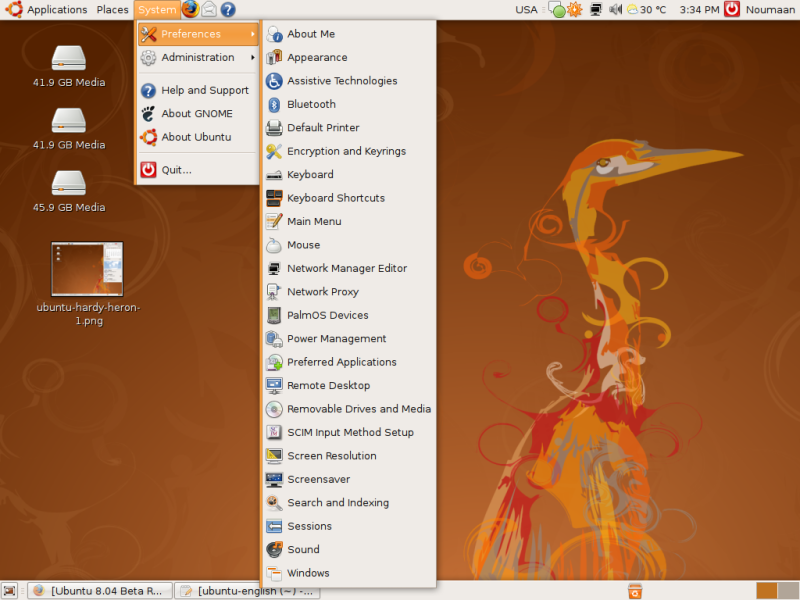 Overall I am very pleased with Ubuntu 8.04 Hardy Heron Beta, I used Dapper for a very long time and I loved it. I hope that Hardy will be even better than the Dapper and will help me convert more people to freedom. Hi, just wanted to let You know about Ubuntu promotional website that is available on http://www.ubuntustory.com . Sajid yes you can upgrade from 7.04 by first upgrading to 7.10. Naumaan, can I updgrade from 7.04 to this new version? there is no clue in official documentation. There is an extension to use the old location bar behavior, although I can’t recall the name of it offhand. As far as Google BrowserSync goes, it will probably get updated once Firefox 3 gets closer to it’s release date, or at least when it reaches RC status. Overall I’ve gone from Feisty to Gutsy and now to Hardy, and I’m finding Hardy is much better than Gutsy, with none of the annoying video issues that made me use Envy to get my older Nvidia card working, although now if I use the INF file for my Envision LCD panel X refuses to use it. So I just use the Plug and Pray monitor settings, which seems to be working okay and lets me run 1280×1024.